Once building surfaces have been cleaned and restored, they should be protected against future weathering and deterioration. The primary concern is to prevent the build-up of dirt particles and damp which can react with the masonry and reduce its lifespan. Protecting surfaces also extended the cleaning cycle. Aqua Fend® impregnation products offer the highest grade of surface protection. Aqua Fend® effectively protects concrete and stone surfaces, forming an impenetrable but breathable barrier against surface contaminants without affecting surface colour. As the capillaries of the surface are protected, contaminants will sit on top, allowing them to be removed by basic cleaning operations. Thanks to Aqua Fend®, pollution, oil, grime, grease, bird droppings, algae and other surface contaminants are no longer an issue or expensive to remedy. Many leading companies trust Aqua Fend®, including numerous city-based banks and property management agents, among others. Independent tests have shown Aqua Fend® to be the industry’s leading surface and facade protection solution. Aqua Fend® range now includes four exclusive products that are specifically designed to protect buildings, pavements and floors against a multitude of unwanted contaminants. “With a clear margin, Aqua Fend® was the best performing surface protection material used in this investigation”. 0.0% VOC content (Volatile Organic Compounds). Solvent-free and non-toxic, LC 50 rating in excess of 10,000. No restrictions for internal use. Aqua Fend® prevents unsightly discolouration or marking of surfaces. 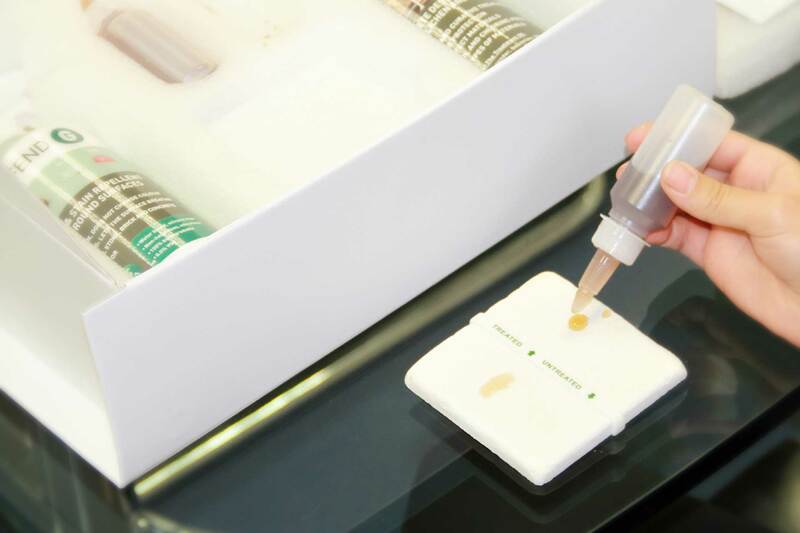 Problems caused by staining can be costly to remedy – be they through organic growth on a façade or other causes, such as coffee stains or discarded chewing gum. Aqua Fend® creates an invisible barrier, making staining avoidable and cleaning easier. Problematic stains no longer penetrate the surface. Allows easy removal of graffiti, chewing gum and greasy stains. 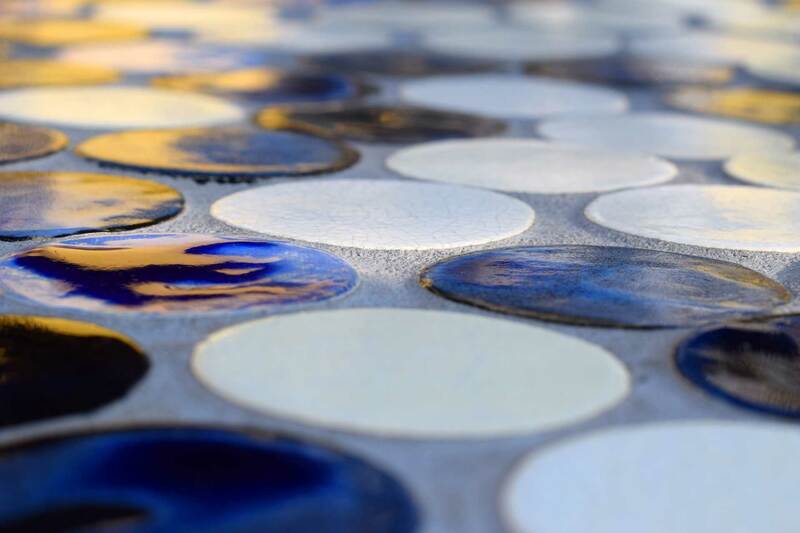 Delays the ageing process, enabling surfaces to look new for longer. 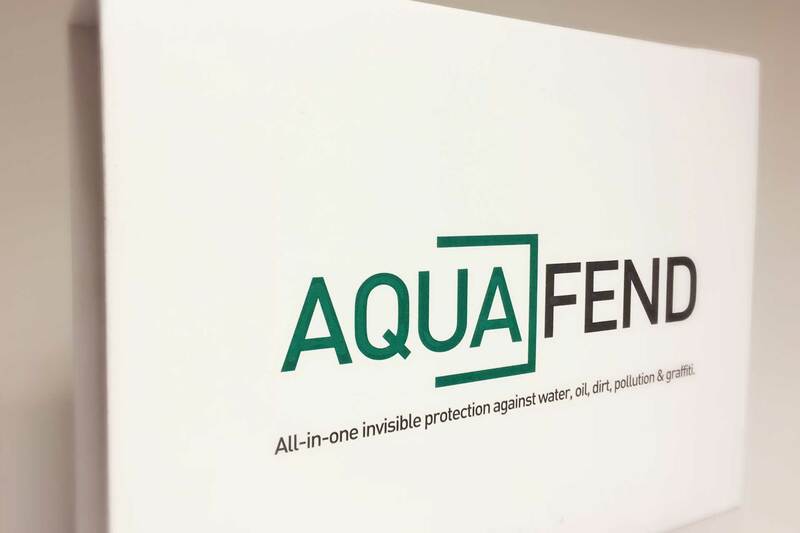 By forming an impenetrable but breathable barrier against surface contaminants, Aqua Fend® allows surfaces to breathe. Surfaces remain greater than 90% permeable. Residual moisture is not trapped within the surface. Enjoy a warmer building and lower bills. Whether it’s stone, brick or concrete, Aqua Fend® keeps the substrate dry, enhancing the building’s thermal resistance. Long-term protection: for a building to retain its optimum value, there is a need for it to be well-maintained. Unlike some competitors’ products, Aqua Fend® is not removed by cleaning works. Offers protection and a life expectancy of twenty years on facades. Product performance can be guaranteed by way of a ten-year insurance backed warranty. Prevents damage to the structure, including unwanted organic growth. Reduces ongoing maintenance costs, allowing a quick return on investment. Aqua Fend® F has been formulated to protect building façades and extend the period for which a building remains clean. 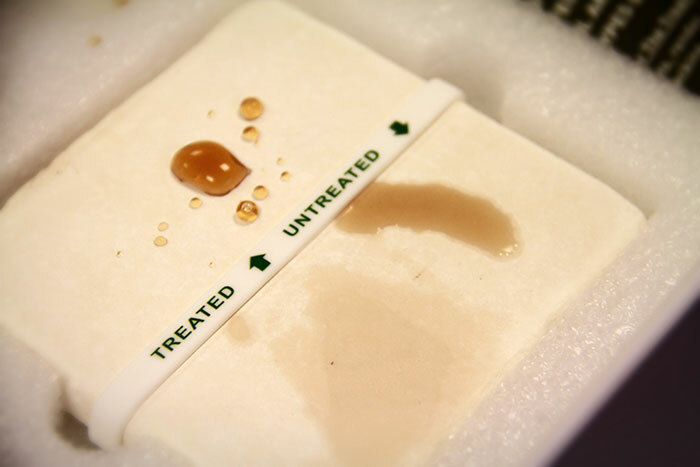 It is a fully breathable product, completely invisible on the surface but preventing water and contaminants from entering the pores of the substrate, causing them instead to run down to the ground. It prevents water ingress, which could otherwise lead to staining or organic growth. It defends against most stains and pollutants that can be caused by passing traffic or pedestrians. Keeps your building clean for longer. Reduces cleaning and maintenance costs. Ensure surfaces become water-repellent – water can cause staining, damp, green growth and the corrosion of reinforcing steel work. Make surfaces more resistant to atmospheric pollution. Facilitates the removal of graffiti. Restricts the formulation of micro-organisms such as moss, lichens and fungi, thereby avoiding unnecessary, hard-to-remove staining. Aqua Fend® Liquid Glass (LG) is the most powerful anti-graffiti product on the market, with numerous benefits over traditional polyurethane, rough coverings and two-part systems. Completely clear in appearance, the product is based on nanotechnology. It is resistant to UV, alkalis, acids and extreme temperatures and offers excellent abrasion resistance, making it incredibly durable. Removal of graffiti becomes significantly easier with Aqua Fend® LG, making it ideal for city locations. A clean, dry surface can be quickly and easily re-treated. Aqua Fend® LG is available in quantities of 1 L, 5L or 25L. Aqua Fend® AM destroys all parasitic vegetation, which is then washed away by the rain or simply brushed off. It does not alter the colour of the substrate, does not create a film and does not yellow. It replaces common acid and alkaline cleaners, which can be harmful to substrates. Aqua Fend® AM can be applied outdoors to all types of material and offers a complete destruction of moss, lichen and fungus – indeed, any parasitic vegetation – as it is a preventive and curative treatment, Nonylphenol and Chlorine-free. Read more about at Aqua Fend® frequently asked questions page.